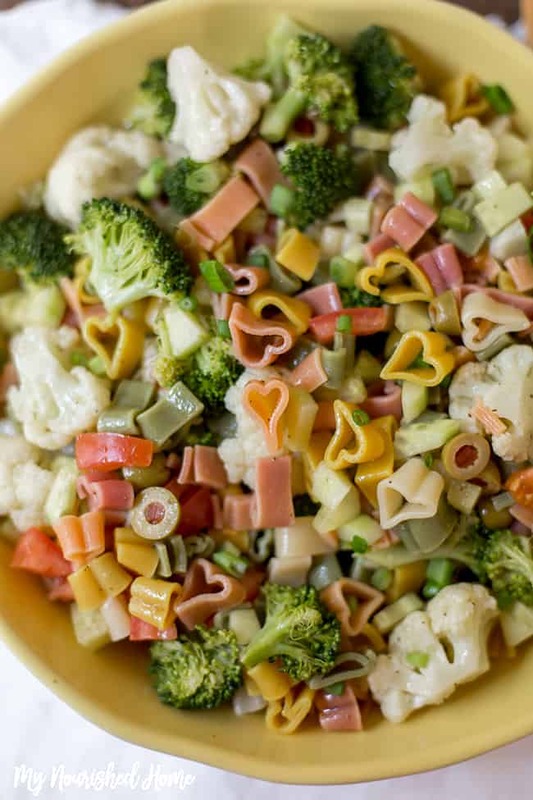 This simple pasta salad recipe would make the perfect side dish for any lunch or dinner. Not to mention, it is super easy to make with prep time and cook time coming out to less than 30 minutes! Feel free to make this recipe your own, change it up with your favorite vegetables, use different olives, or add some feta cheese! We love it all and I often use this recipe as a way to polish off leftover bits of vegetables in my vegetable drawer! 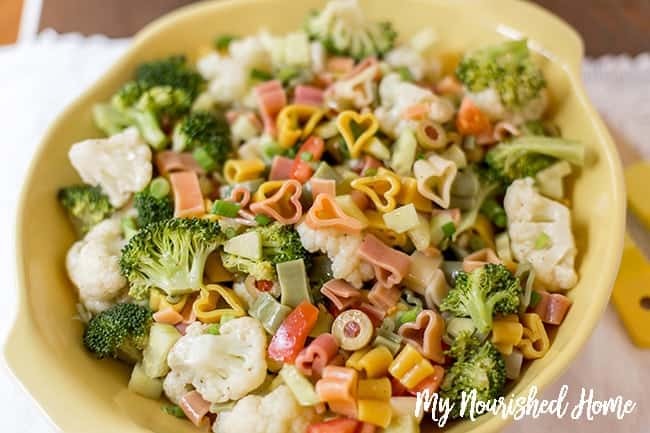 We love pasta salad over at our house and this vegetable pasta salad is no exception. This recipe is one that can be easily recycled through your meal plan because of how easy it is to make. It is also a fun way to get those veggies into your family’s diet without serving them plain. 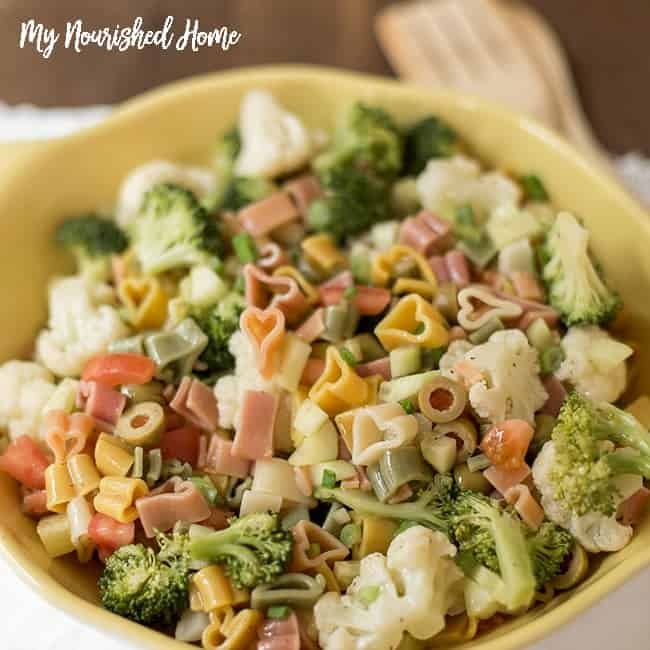 Simple pasta salad is a common side dish for summer parties and cookouts, but this recipe is good any time of year with any type of meal. Plus it is so quick and easy to make that you can whip it up on short notice. 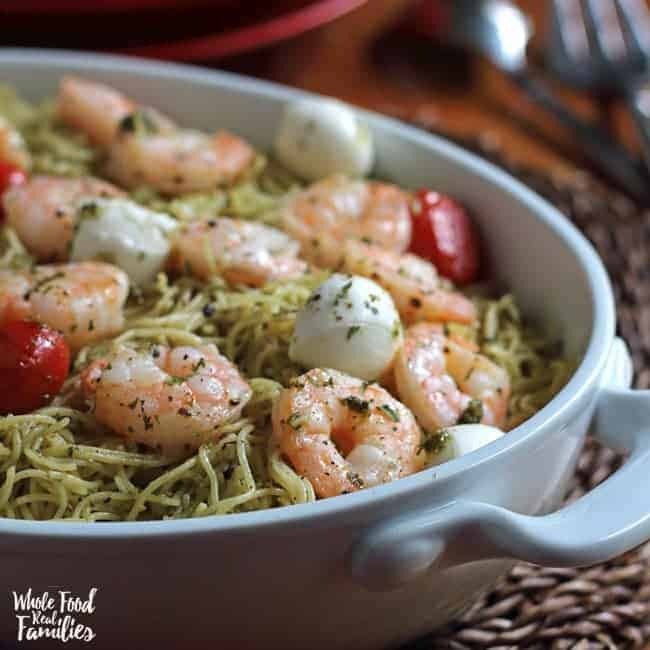 If you are in a rush you can alter this recipe to make it even quicker by replacing the sauce in the recipe with your favorite Italian dressing! If you want it to be a stand-alone meal, dice baked and seasoned chicken and toss it in the pasta dish and toss. Sometimes I can get my kids to eat vegetables this way when they are on hiatus from all other methods and recipes. During the week, it is hard to make the time for extensive side dishes with dinner, but we try to get something delicious on the table. So most of the time I make quick, easy, and yummy recipes like this simple pasta salad recipe. When time is very short, I have been known to cheat and replace the sauce with Italian dressing! Nobody seems to mind – and I feel good about all the veggies. 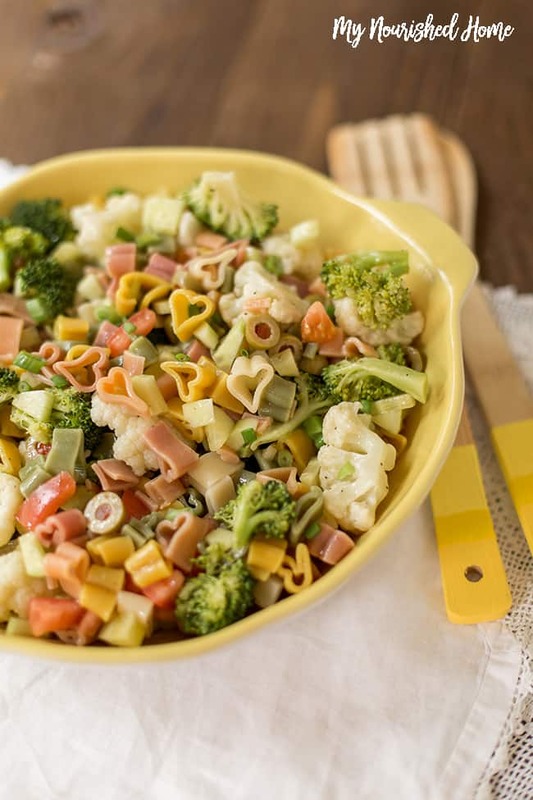 Some ideas for this vegetable pasta salad are to serve it along with burgers, barbecue, steak, or pork chops. I even eat it by itself for lunch sometimes! 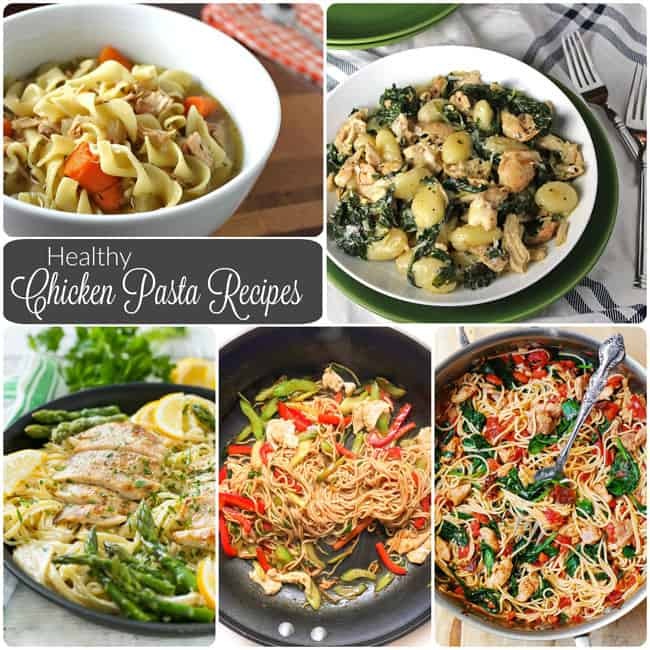 Try this Easy Shrimp Pasta Caprese or one of these Healthy Chicken Pasta Recipes. Cook pasta, al dente. In the meantime, prepare the vegetables. In a large bowl combine all the ingredients. Yes, even the dressing and vinegar. Toss and let it sit in the fridge for a couple of hours before serving. Check for seasoning - I always add some kosher salt. This pasta salad goes well with just about any meat. Add the additional ingredients you love - peppers, red onion, or feta cheese! Previous Post: « How to Prepare Before Your Kids Get Sick!